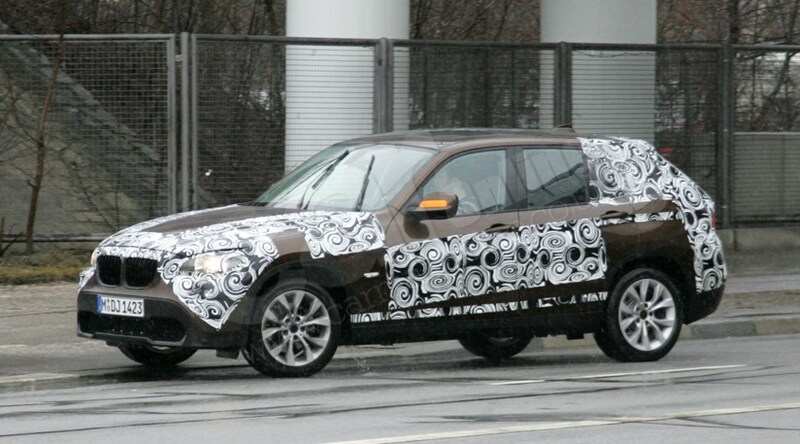 These latest spy photos capture BMW’s headlong rush into smaller SUVs. Yes, the new BMW X1 is nearing production reality – and our new scoop pictures prove the production X1 follows closely the tippy-toed 4x4 style of the Paris 2008 concept car. Dubbed E84, the new BMW X1 borrows the oily bits from today’s E90 3-series which helps keep costs down from the pricier X3 and X5. No surprise there, but even the 4x4 sceptics in the office are impressed by the anticipated £23,000 starting price for an X1 18d come autumn 2009. That makes it cheaper than the equivalent 3-series Touring. What’s new on the BMW X1 from the concept car? Hardly anything. The silhouette captured by our spies in Germany is almost identical to the Paris show car. This was a classic ‘concept lite’ by our friends in Munich, whose real intention was the usher in a range extension to a buying public softened by a decade of X3, X5 and X6 sales. To prove the X1 soft-roader has the SUV gumption to match the bravado, BMW is equipping the X1 with xDrive four-wheel drive. It’s a similar system to that in the X6, with a rear-biased 60:40 torque split and a barrage of electronic traction nannies to keep the handling shipshape on road or grassy field. Which engines can I buy in the BMW X1? There will be a 261bhp 3.0-litre petrol straight six at the top of the family tree, but the big sellers are likely to be the smaller diesels familiar from the donor 318d and 320d saloons and estates. All will come with Efficient Dynamics, bringing BMW’s stop-start and intelligent alternator control to stymie those fuel and tax bills. Even the profligate 3.0 range-topper should top 28mpg while hitting 62mph in less than 7.0sec. How practical is the new BMW X1? Very. We hear it will pack a 410-litre boot, extending to 1500 with the seats flopped down. Which makes it a tempting proposition for those who find the 3-series Touring just a little too obvious.